The title of Bailing Out (Kaskade rückwärts) refers to a particularly tricky equestrian move where the rider, rather than performing an emergency dismount by a normal method, does a backwards somersault off the rear of the horse. The move is ably demonstrated in the film and is impressive, but it’s really a stunt move that no horse rider is likely to use unless they like to show off and don’t mind a few broken bones in the learning process. In the context of the film, the move also refers to the sudden decision of a dispatcher named Maja (Marion Wiegmann) to “bail out” of her placid small town existence and start things anew in the city. Her husband had died and Maja is having trouble moving on, much to the consternation of her teenage daughter, who sees her mother settling into a rut. Maja eventually decides to go for it. She moves to the city and starts learning to become a train conductor. Teaching her the ropes is Gerd (Siegfried Höchst), a crusty, lifelong bachelor who manages, somehow, to be both stodgy and eccentric. Playing matchmaker for Maja is Carola (Johanna Schall), a frustrated wife who is living the single life vicariously through Maja. While DEFA prided itself (with some justification) on films told from a female perspective, the fact is, most of these films were made by men. It is interesting to compare this film, which was directed by Iris Gusner—the only female film director working at DEFA at the time—with Egon Günther’s Her Third, which covers similar territory, but was written and directed by men. Curiously, Her Third is harsher in its criticism of male behavior than Gusner’s film. Bailing Out offers a more nuanced picture of things. The men here are still problematic, but not simply because they are pigs. Some are just oddballs who probably will never meet a woman—or any other person, for that matter—that they can relate to; and the women have their own problems. For a while, it looks like Maja might start a relationship with the music teacher Toni (Jaecki Schwarz), who praises her singing, but who is more interested in her voice than being a boyfriend. We know where this film is heading, and it eventually gets there in its sweet, oddball way. Iris Gusner’s film credentials are impressive. She studied under Mikhail Romm at the All-Union State Institute of Cinematography (VGIK, now known as the Gerasimov Institute of Cinematography), and worked as assistant director to Konrad Wolf on Goya. Her first feature film, The Dove on the Roof, was banned, so she did what most directors faced with this situation chose to do: she played it safe next time by making a fairytale film (The Blue Light). She scored her biggest hit with All My Girls. A few months before the Wall came down, Gusner moved to Cologne, where she worked in television. In 2009, Fantasie und Arbeit: Biografische Zwiesprache (Fantasy and Work: A Biographical Dialog) was published; a book she co-wrote with West German filmmaker Helke Sander. Maja is played by Marion Wiegmann, a theater actress who worked primarily at the Brandenburger Theater. 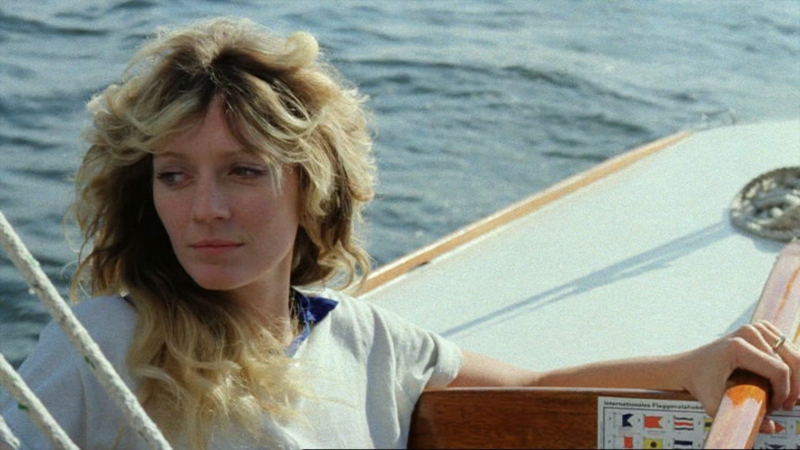 Bailing Out was her only feature film, but it was enough to garner her the award for Best Actress at the 1984 National Feature Film Festival of the GDR (Nationales Spielfilmfestival der DDR). In 2014, she received an award from the Brandenburger Theater for her work there. Like Wiegmann, co-star Siegfried Höchst was also a theater actor. Unlike Wiegmann, however, Höchst never recovered from the fall of the Wall. Born into an impoverished situation, Höchst was an ardent believer in the ideals of communism and worked to support the SED. He was an excellent actor and appeared in several films and TV movies as well as appearing on stage. Unfortunately, he was also a heavy drinker, a problem that got progressively worse during the seventies. Coming out of rehab in the early eighties, he started to work again, and even managed to direct a couple TV movies before the Wall came down. But when the republic began to falter, Höchst returned to the bottle. After the Wende, Höchst withdrew from public appearances, preferring to stay home and drink. His exact date of death is unknown. His body was found on December 13, 1991, but he had apparently been dead a few days already at that point. The real star of the film is Johanna Schall. Whenever she’s on the screen, it’s hard to watch anyone else. Schall comes as close to royalty as the GDR had to offer. Her father was Ekkehard Schall, one of the foremost interpreters of the works of Bertolt Brecht, and her mother was Barbara Brecht-Schall, the daughter of Helene Weigel and Bertolt Brecht. After reunification, Schall worked as a director for various theaters across Germany, while, at the same time, appearing in television shows and giving guest lectures. In 1992, she starred in Apfelbäume (Apple Trees), which was screened in the Un Certain Regard section of the Cannes Film Festival. These days, she prefers to work behind the scenes as a theater director. She also writes on a number of topics on her blog (in German, of course). At the start of Bailing Out, we hear Maja sing a song over the dispatch radio to one of the truckers. The song was written by Christian Kožik, a composer living in Potsdam. The lyrics are based on Ballade de la belle heaumière aux filles de joie (Ballad of the beautiful helmetmaker’s wife to the ladies of the night) by François Villon. Villon’s poem is a warning to pretty young women that someday their beauty would fade, so they’d better get all they can while men are still putty in the their hands. The poem was also the inspiration for Auguste Rodin’s La Belle qui fut heaulmière, a sculpture of a withered old woman, sitting on a rock. Bailing Out is an odd film with middle-aged leads, quirky behavior, and unusual career choices. Perhaps this was too odd for the East German audience because the film didn’t stay in theaters long and actually got better reviews in West Germany than in the GDR. For anyone interested in the East German Frauenfilme (Women’s films), this is a good follow-up to Gusner’s All My Girls, which also looks at working women, but at a different point in their careers. Buy or stream the film. One of the goals of DEFA films, stated at the very start of the production company, was to present stories from as objective a viewpoint as possible. When Kurt Maetzig made The Council of the Gods, his intention was to avoid both the romanticism of Hollywood and the socialist realism of Soviet films. He wanted to make a film that, first and foremost, told the truth about how international corporations (most notably Standard Oil) fed and supported Hitler’s war machine. It was still a feature film, but with a higher level of factual accuracy than most of the films at the time. Over time, DEFA drifted away from this approach, but director Lothar Warneke wanted to return to the idea of documentary fiction and see how far he could push it. In Apprehension (Die Beunruhigung) he pushes it right to edge. Warneke has given us a film that is just barely a feature film in the traditional sense of the word. In nearly every aspect it resembles a documentary. It’s shot in grainy black-and-white with hand-held cameras in the academy standard aspect ratio, which was unusual for a film made in 1981 (for more on the thorny topic of aspect ratios, see The Flying Dutchman). Sometimes people on screen look self-consciously at the camera, as if they weren’t expecting to be filmed, and maybe they weren’t. At times, the cameras seems to be hiding from the subject, peeking out from behind corners to catch the action. Several of the actors weren’t even actors at all. The doctor who performs the breast examination was an actual doctor. He was fed no lines, but simply instructed to tell the lead actress exactly what he would tell a patient in the same situation. At the center of the story in the film is Inge Herold, a successful psychologist, who spends her days listening to the problems of others, and spends her nights hopping into the sack with a married man named Joachim. After a doctor’s examination, Inge is told by her doctor that they have found a lump in her breast. She must come in the next day to the hospital, for surgery. If the lump is benign, they’ll simply remove it. If it is malignant, she’ll have to undergo a radical mastectomy. For the rest of the movie, the camera follows Inge as she comes to terms with this possibility. She cries, searches out old friends, confronts people, and eventually comes to terms with things. Apprehension isn’t the first film to blur the line between reality and fiction. Films such as Robert Flaherty’s Louisiana Story and Haskell Wexler’s Medium Cool had already mixed actual events with fictional stories, while “found footage” horror films such as Cannibal Holocaust, The Blair Witch Project, and Paranormal Activities rely almost entirely on this conceit to deliver their chills, but Apprehension is different. Nothing here feels fake or forced. This could have been a documentary, except that it isn’t. Fernando Meirelles and Kátia Lund’s City of God comes close to capturing the same spirit, but even here the inherent fiction of the story feels more like storytelling that Warneke’s film (for more on Lothar Warneke, see Bear Ye One Another’s Burdens). Inge is played by Christine Schorn. Born in Kiel to parents who were also actors, Schorn, appeared many times on television in East Germany before finally appearing in Her Third, her first feature film role. Schorn had a successful career in East Germany, not only on film and in television, but on the stage as well. After the Wende, feature film roles dried up for a while, and she went back to television and the stage, but soon she was appearing in films again, most notably Grill Point (Halbe Treppe), Goodbye Lenin!, and Franziska Meletzky’s According to Plan (Frei nach Plan), for which she one a best actress statuette at the German Film Awards. 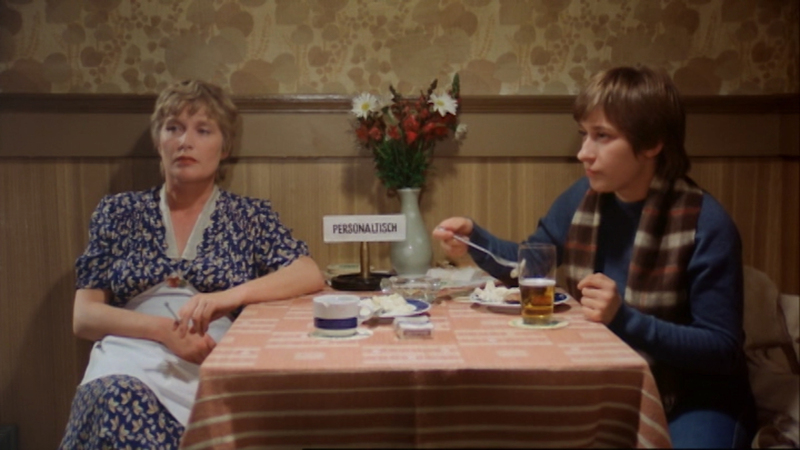 In that film, Schorn played the mother of fellow East German Dagmar Manzel, even though she is only 14 years older than Manzel. The man behind the camera on Apprehension was a young cinematographer named Thomas Plenert. Trained as a documentary filmmaker, Plenert brought a unique look and feel to the film. Warneke was so impressed with his work, that he had him shoot his next two films as well. Meanwhile, Plenert continue to work primarily in the documentary field, including Helke Misselwitz’s classic Winter Adé, and The Wall (Die Mauer), Jürgen Böttcher’s short documentary on the deconstruction of the Berlin Wall (for more on Jürgen Böttcher, see Born in ’45). Apprehension also falls squarely into that category of films known as Frauenfilme. This translates to “women’s films,” and is a very different creature from the “Chick-Flicks” of Hollywood. Unlike the Chick-Flicks, which are devoted almost exclusively to love and romance told from a female perspective, the Frauenfilme tend to deal more with the social issues that affect women—issues such as sexism in the workplace, pregnancy, and the difficulties involved in balancing a career and a family. As discussed elsewhere on this blog, East Germany was way out in the lead when it came to making this type of movie. Films such as Hey You!, The Legend of Paula and Paula, and Her Third had tackled these issues back in the early seventies, but the term wasn’t coined until The Lost Honor of Katarina Blum in 1975. The GDR continued to make films dealing with women’s issue throughout the seventies and eighties with films such as Solo Sunny, Hostess, Solo Sailor, The Bicycle, Today is Friday, Our Short Life, and All My Girls. 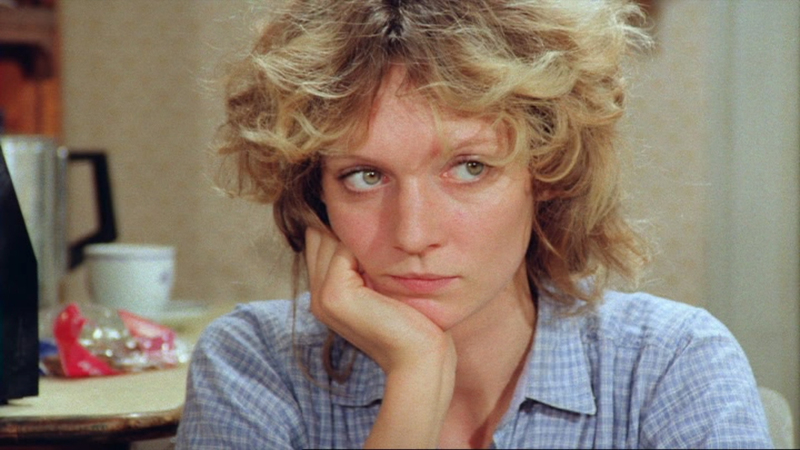 In the West, the Frauenfilme were still outliers, primarily the work of female directors such as Margarethe von Trotta, Ula Stöckl, and Helma Sanders-Brahms. In East Germany, Frauenfilme were much more common, and were made by both male (Konrad Wolf, Heiner Carow) and female (Iris Gusner, Evelyn Schmidt) filmmakers. Nobody expected much from Apprehension, but it hit a chord with the public. It played to full houses, and went on to become the most popular adult-oriented film to come out of DEFA since since The Legend of Paul and Paula. 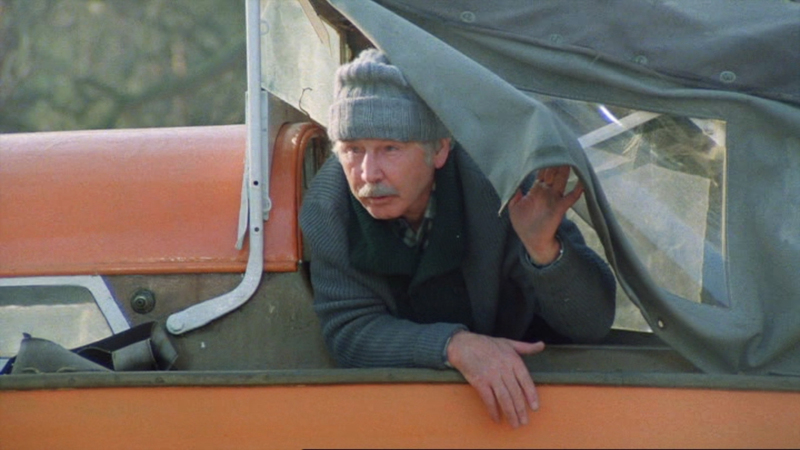 In any history of German film, Apprehension represents an important milestone.